The 2,200-square-foot Exelon Trading Center at UD is modeled on the trading floors in investment banks, brokerage houses and hedge funds on Wall Street. 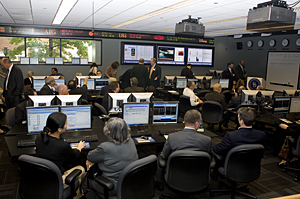 1:58 p.m., Oct. 17, 2008----In the middle of a month like no other on Wall Street, it was more than business as usual when the University of Delaware inaugurated its Exelon Trading Center on Thursday, Oct. 16, in Purnell Hall. Designed to replicate the trading floors in investment banks, brokerage houses and hedge funds on Wall Street, the 2,200-square-foot center contains 16 classroom workstations, as well as four research room workstations and real time feeds to two tickers and four LCD displays. About 100 guests attended the event, including UD President Patrick Harker and Ian McLean, executive president for finance and markets at Exelon, as well as faculty, staff and students in UD's Lerner College of Business and Economics. While state-of-the-art LCD screens and real-time tickers displayed the latest business information, Conrado M. “Bobby” Gempesaw, dean of the Lerner College of Business and Economics, thanked those whose support turned a vision into a working reality. 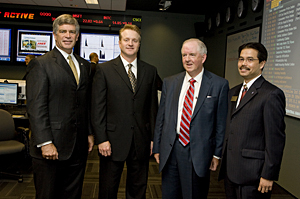 In thanking Exelon and supporters of Exelon Trading Center, Harker said that the advantages the center holds for students and faculty complement the University's strategic planning goals on its Path to ProminenceTM to helping UD attain national and global recognition as a leading educational institution. McLean cited the efforts of Exelon Power Team trader and UD alumnus Frank Henshaw in bringing academia and industry together. The center, which opened last spring, was funded in part by a $500,000 donation by Exelon. Kenneth Cornew, senior vice president of Exelon and president of Exelon Power Team, said that everyone involved should be proud of the opportunities created by the partnership between Exelon and the University and its students and faculty. A student perspective was offered by Jason Dague, senior finance major from Hershey, Pa., and vice president of the Blue Hen Investment Club, a registered student organization. 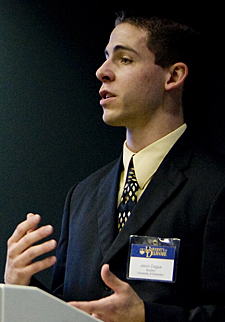 Dague worked with UD's Information Technologies department in developing the lab and installing the array of computer stations used by student traders in the Exelon Trading Center. Ann Viselli, UD alumnus and deputy treasurer in the Delaware Office of the Treasurer, noted that when she began her master's program at UD in 1987, the movie Wall Street has just been released and the hottest rock groups were U2 and REM. Viselli also noted that technology represented in the new trading center has changed considerably since her grad student days at UD. 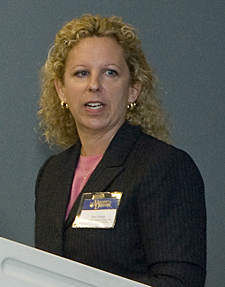 Stephen Schork, president of the Schork Group and editor of the Schork Report, U.S.A., said that the trading floor of the Exelon Trading Center represented the crossroads of the real world. The inaugural presentations concluded with a demonstration of the many technological tools available at the center by Rich Jakotowicz, a manager in the Lerner College of Business and Economics. Following the inauguration of the Exelon Trading Center at UD, representatives from UD and Exelon traveled to the New York Stock Exchange to ring The Closing Bell®.